When sound control acoustic door assemblies are selected, the usual way is to specify a sound transmission coefficient (STC) rating in accordance with established standards. Derived from testing at a series of frequencies within the range of human hearing, STC is a single number assigned to a door assembly that rates its effectiveness at blocking sound transmission. This sounds simple and logical, just like hourly ratings on fire doors, but the situation is far more complicated. The challenge with having a catch-all solution in the form of specifying the ‘right’ STC comes down to the range of sound. For example, if a project concerns a high school band’s practice room, the noise that needs to be reduced comes from instruments ranging from the low-frequency (pitch) of a bass drum to the high pitch of woodwinds or chimes. For this application, STC would be appropriate since sounds from many frequencies all need to be blocked or reduced. However, selecting the right door for a mechanical equipment room at the same school is quite different. Low pitch and constant machinery noise needs to be filtered out. Using the STC rating system for this opening could be much more expensive than necessary to be effective. 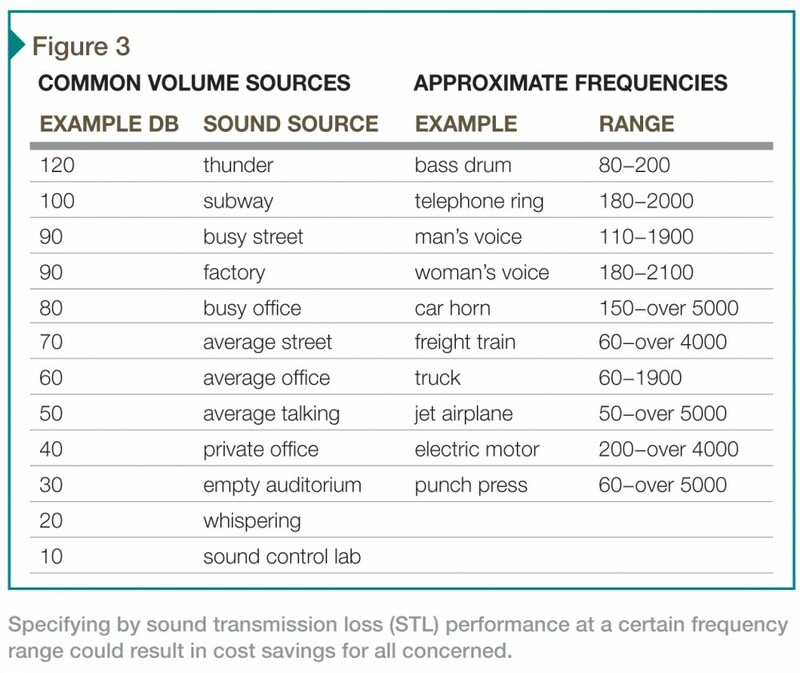 Fortunately, there is another metric more suited to these situations—sound transmission loss (STL). The STC rating is actually derived from an average of STL performances. Since STC relies on testing data that establishes the reductions at each individual frequency, the data can be used to determine the STL needed at a specific frequency or frequency range without additional testing. This article is not intended as a lengthy discussion of all aspects of sound control, designs, gaskets, or installation. 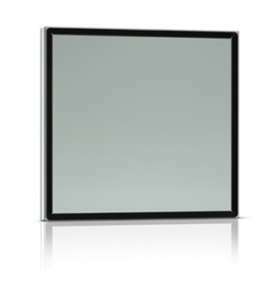 Rather, it seeks to clarify some misconceptions about STC and suggest using alternate values and standards when specifying acoustic door and window assemblies for a particular sound control purpose or requirement. The authors believe STL is the definitive method of specifying acoustic assemblies, and better accomplishes what the sound-deadening qualities are to be required for a specific opening. 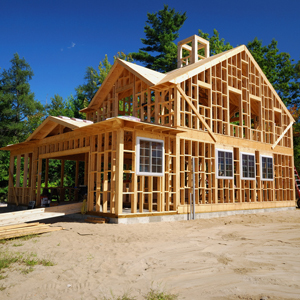 On a practical level, this means the building owner gets what he or she really needs, often for less money. To make this argument clear, six myths must be examined. It is important the reader be a least somewhat familiar with some of the ASTM standards applicable to lab testing and rating of sound control assemblies. To that end, ASTM E90, Standard Test Method for Laboratory Measurement of Airborne Sound Transmission Loss of Building Partitions and Elements, describes the test chamber, testing method, frequencies to be reported, and other lab requirements. However, it does not contain the method of establishing the rating. A second standard like ASTM E413, Classification for Rating Sound Insulation, or ASTM E1332, Standard Classification for Rating Outdoor-Indoor Sound Attenuation, needs to be included. 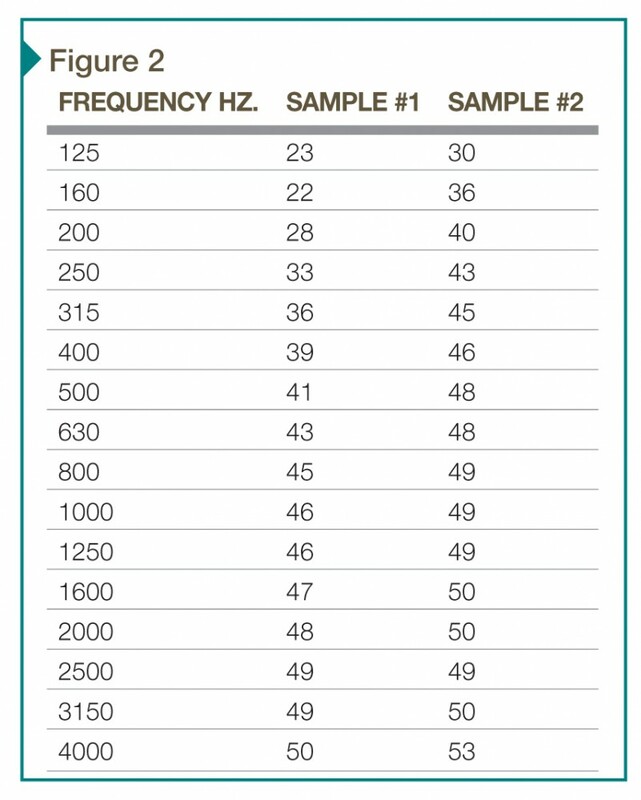 ASTM E413 is used to define the 16 frequencies at which sound transmission losses in decibels are measured. It also establishes the sound insulation contour values of those frequencies and the sound transmission loss values for each corresponding frequency. From this, a reference contour can be created to which actual test data can be graphed and compared. Interestingly, the profile of this reference contour remains constant for all graphs and is shifted up or down on the graph to obtain a single STC rating (Figure 1). ASTM E1332 is used to calculate an outdoor/indoor transmission class (OITC) and covers a range from 80 to 4000 Hz. This standard has an extended lower range of frequencies for which the results are calculated rather than graphed. The additional frequencies are intended to measure STL in decibels for outdoor to indoor sound exposure resulting in a different OITC rating. The calculations generally result in a somewhat lower single rating than does ASTM E413 for STC. In order to convey the purpose of this article, two fictitious ASTM E90 test results—derived from two different examples—are shown in Figure 2. The columns listed show the 16 STL numbers achieved at each frequency of the ASTM E413 test. Ratings are at random and do not necessarily represent a specific door assembly or manufacturer—however, these sample numbers are not unusual. Sample 1 would be typical of a less-expensive door assembly with an STC of about 40 while Sample 2 would represent an assembly costing two to four times as much with an STC of over 48. As the image illustrates, depending on the frequency of sound, one can save the client a lot of money by specifying the less-expensive door. To understand how those STL values relate to real-world conditions, the reference charts of common volume sources and approximate frequencies are provided as examples in Figure 3. Simplistically, to reduce the volume from a busy office with mostly male employees to that of a private office, the assembly should be capable of at least an STL of 40 at a middle frequency range. 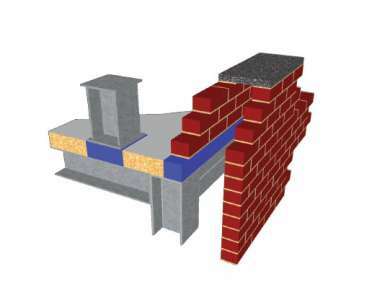 The lower cost Sample 1 would be sufficient in lieu of the more costly Sample 2 usually specified. To reduce the noise from a bass drum or low-frequency vibrations, the maximum STL should be concentrated in the corresponding frequency range. Here, Sample 2 would be the better choice. Other noise sources should be evaluated accordingly and the correct door assembly chosen to meet the best STL at a certain frequency range. At higher-frequency ranges, Samples 1 and 2 are not really much different in performance, but substantially different in cost. Neither ASTM E413 nor ASTM E1332 establishes an STC (OITC) value of the ‘perfect’ acoustic door assembly. To evaluate test results to a single number, they must be compared to this contour. The key to this comparison is referred to as the ‘deficiency’—any measured sound transmission loss (STL) variation below the contour. The STL measurements above are not considered variations. Unless otherwise noted, ASTM E413 limits these deficiencies to a maximum total of 32, and a maximum of eight at any single frequency. 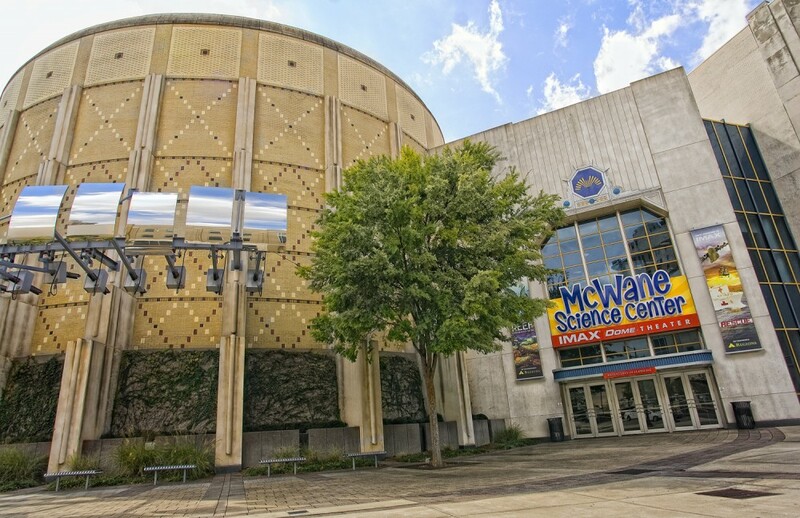 For projects like this IMAX movie theater in Brimingham, Alabama choosing a door with the proper acoustical ratings is critical. Acoustical doors are available in a wide range of sizes for a wide range of applications, such as this Georgian power plant. Unlike fire door assemblies rated based on a certain time and temperature curve, the method of calculating STC by test data and deficiencies from a sliding reference contour can result in different ratings. The test lab will generally use the most advantageous graph in the test report. This will be the one with the highest STC or OITC rating that falls within the parameters of the deficiencies. This rating, however, may not be the one with the lowest total of deficiencies or the one closest to the reference contour. With that in mind, one can see STC expressed as a ‘single’ number does not necessarily mean it is the ‘only’ number available. The five graphs in Figure 4 show how the STL remains constant while the reference contour is shifted up or down to determine STC. It is important to remember the STC is the point at which the reference contour (not the STL contour) intersects at 500 Hz. 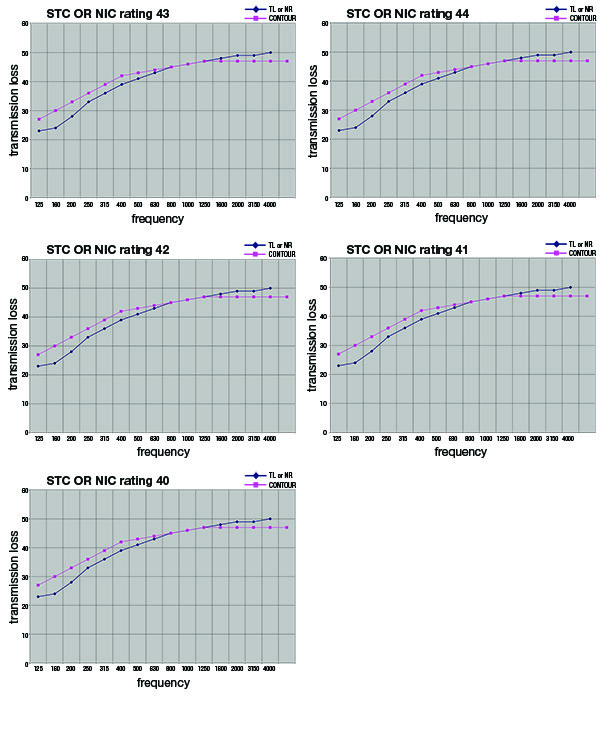 This means even though the STL at frequencies is identical in the five graphs, the sample could have multiple STC ratings depending on the variation parameters. For example, the maximum STC (complying with ASTM E413) of the assembly is 43 (with 30 deficiencies) in the graph in Figure 4a. If an STC of 44 is attempted—as shown in Figure 4b—the result is a failure at 42 deficiencies and nine deficiencies at 160 Hz. STC 40, with eight deficiencies as in Figure 4e. 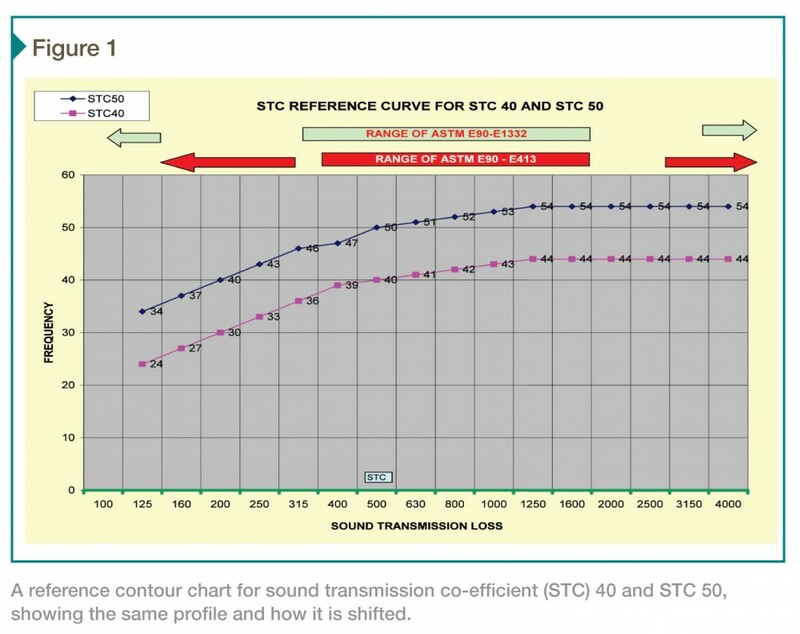 STC ratings below 40 result in a lower number of deficiencies when the sound transmission coefficient is the only determining factor. This should demonstrate the rating method has far less reliability than what is associated with fire door ratings where the time and temperature curve is more consistent. A: In this two contour chart, the cyan is STC 43 with 30 deficiencies, while the dark blue represents STL 41—both are at 500 Hz, as are all of the other Figure 4 graphs. B: Cyan is STC 44 with 42 deficiencies, and dark blue is STL 41. C: Cyan reprents STC 42 with 21 deficiencies, and dark blue remains as STL 41. D: The cyan line plots STC 41 with 14 deficiencies; dark blue is STL 41. E: Cyan is STC 40 with eight deficiencies; dark blue is STL 41. Under MasterFormat, Sections 08 11 13–Hollow Metal Doors and Frames, 08 12 13–Hollow Metal Frames, and 08 13 13–Hollow Metal Doors, are intended to describe common applications of swinging hollow metal (e.g. steel) doors and frames. Not all manufacturers capable of fabricating hollow metal doors and frames are also capable of fabricating acoustic door assemblies, especially those over STC 35. They may also not have the up-to-date testing data and technology to fabricate such specialized products. This could lead to a litany of exclusions or qualifications at bid time; difficult to manage and compare for any distributor or general contractor. The correct section to specify acoustic door assemblies is 08 34 73–Sound Control Door Assemblies, as this incorporates the latest in acoustic door assembly standards (e.g. 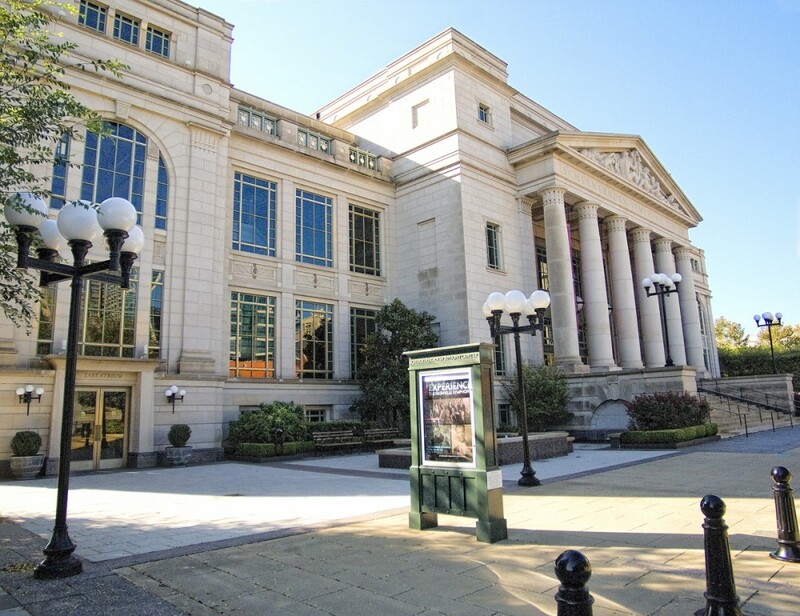 American National Standards Institute/ National Association of Architectural Metal Manufacturers Hollow Metal Manufacturers Association [ANSI/NAAMM HMMA] 865, Metal Doors and Frames) that describe qualifications, details, and requirements for this specialized product. This ensures the project benefits from the expertise of manufacturers who are familiar with sound control and have conducted a sufficient number of tests in various configurations. 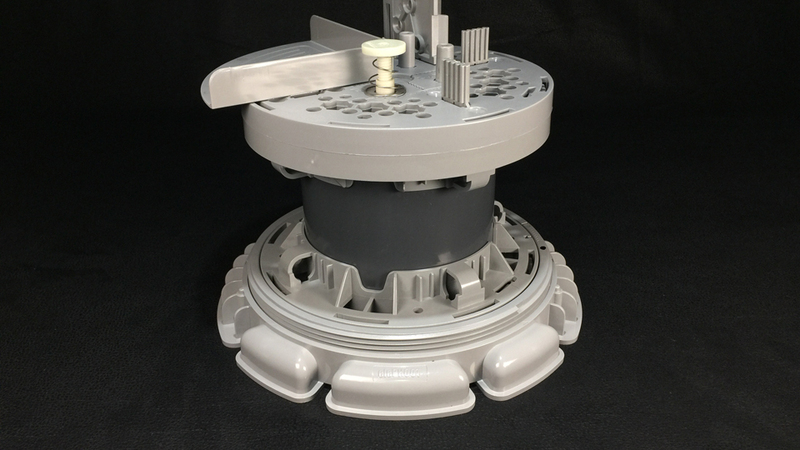 In order to perform the specialized performance functions required of STC-rated assemblies, the internal construction of doors must be of sufficient mass or innovative design. In some cases, this may conflict with other performance requirements such as fire ratings, universal accessibility, security, life safety, or wind loads. Documents such as the aforementioned HMMA 865—or HMMA 850, Fire-rated Hollow Metal Doors and Frames, and Steel Door Institute (SDI) 128, Guidelines for Acoustical Performance of Standard Steel Doors and Frames—contain design or other information useful in determining which performance functions are the most important to the project. 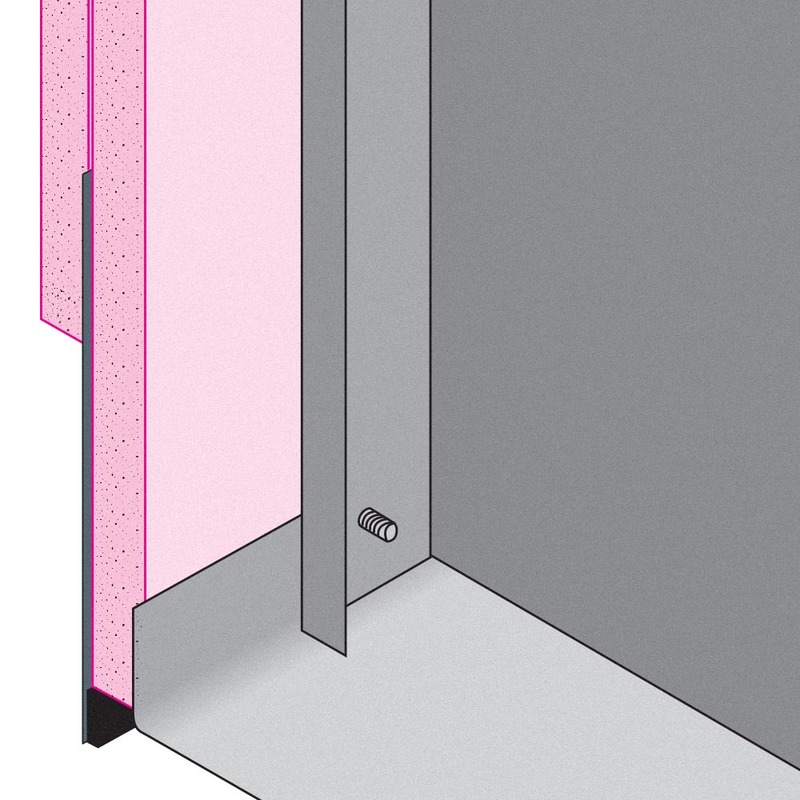 For example, an STC-rated door assembly also required to have a 1 ½-hour fire rating might be located in an area where a 20-minute fire rating suffices. 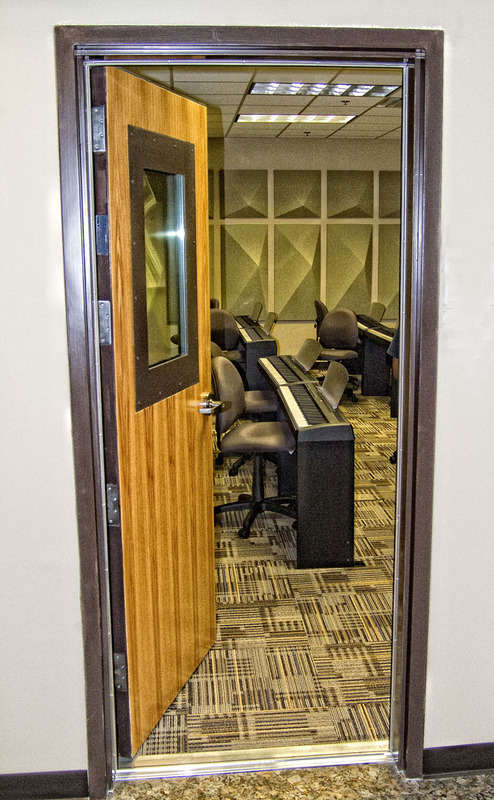 An STC-rated door assembly where the entire project is also specified as meeting accessibility needs may be in a critical sound-control room where the accessibility is not the main function. Qualified manufacturers of these specialized products should be well-equipped to discuss and resolve such conflicts so the specifier can decide which is the most critical to the individual opening. 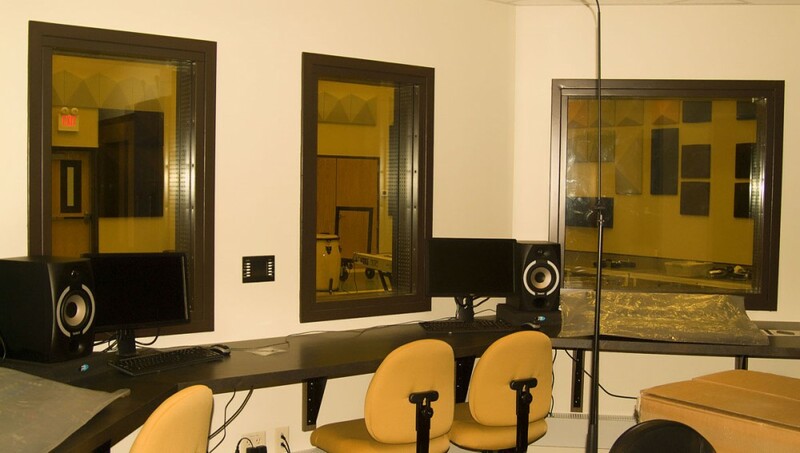 The windows and door for this West Point recording studio needed to meet certain sound requirements. Documents like HMMA 865 and SDI 128 quite clearly dispute this myth. When tested in a lab according to ASTM E90, the instrumentation, room size, calibrations, ambient conditioning, humidity, or other factors—in addition to the installation of the test samples—must be controlled within established parameters. Pre-test inspections and adjustments are common. Such stringent controls are not feasible at the project site. Although there are accepted standards for ‘field testing’ of STC, the results of such tests could be five to 10 points less than the lab-tested STC. To be clear, this article does not intend to propose totally replacing the historic STC rating method. It does, however, introduce the option of specifying acoustic assemblies by using a sound transmission loss method at a certain frequency or range of frequencies for special situations. It is important to remember—unlike the STC rating method, the STL lab-tested data does not change. Edward Wall Jr. is the president of MegaMet Industries, located in Birmingham, Alabama. He was nominated to the technical committee and then the executive committee of (NAAMM’s) Hollow Metal (HMMA) division. 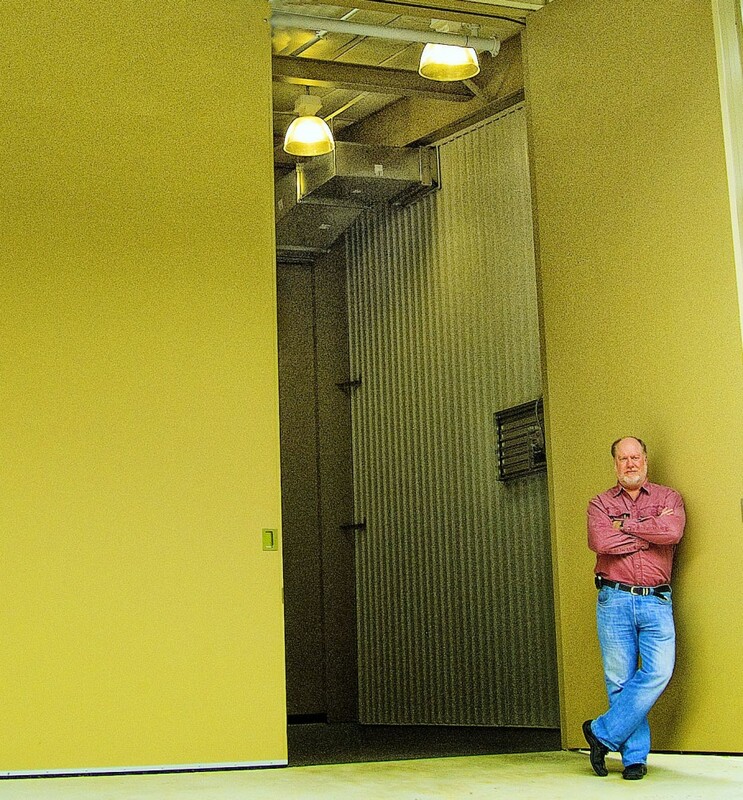 Wall is now closing in on two decades of manufacturing hollow metal and developing specialty door products. He can be reached at ewalljr@megametusa.com. Allan C. Ashachik is an independent consultant, providing services to steel door and frame manufacturers. 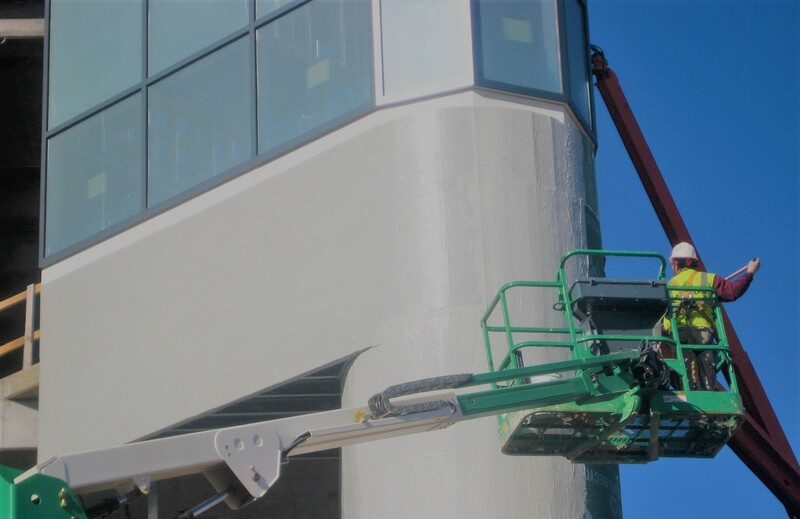 Since entering the industry as a pencil and T-square detailer in 1968, he has been involved in all aspects relating to steel doors and frames from detailing to final quality assurance in acoustic, windstorm, detention, and fire-protective applications. Ashachik is the 2006 recipient of the A. P. Wherry Award, issued by the Steel Door Institute (SDI) to recognize individuals who have made outstanding contributions to the progress of standard steel doors. He can be reached via e-mail at aashachik@neo.rr.com. I agree it is good to look at STL for specific applications. The designs and theories of acoustical design really have changed little over the past 40 years. I know because I worked at Overly Manufacturing Company back in the day of strong demand for acoustical products. Many of my designs from that era are still being manufactured today. Excellent seals and composite materials are what really makes an outstanding product. Unique hardware definately helps, like the cam-lift hinge I designed long ago, now marketed by Zero. Thanks for helping de-mythologize this wide-ranging topic. Designers and architects need to ask the right questions in order to specify appropriate solutions. Assuming that the client’s STC “target” number is the only important data point is a common mistake. The axes on Figure 1 are mislabeled.